The Yonkers Police Department said Detective Frank Fernandez had a blood alcohol content of more than twice the legal limit in New York. 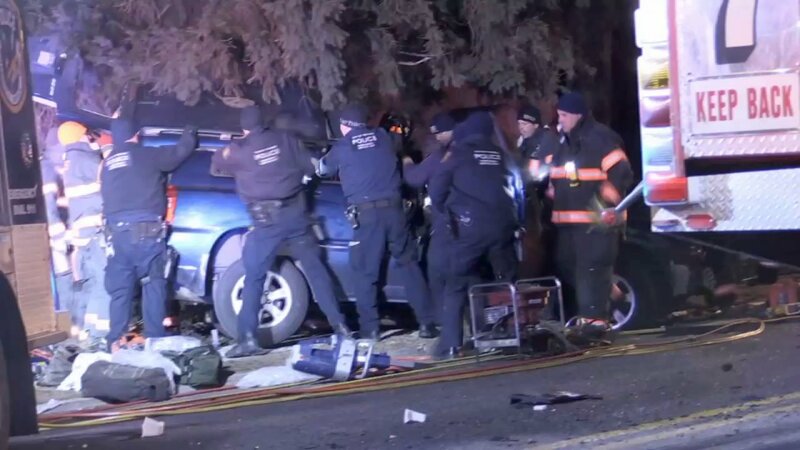 YONKERS, New York (WABC) -- Police said an off-duty Yonkers police detective who died after crashing his car into a fire truck was under the influence of alcohol. The Yonkers Police Department said Detective Frank Fernandez had a blood alcohol content of .22 - which is more than twice the legal limit of 0.08 in New York. The investigation found Fernandez crossed the center line on Palmer Road at about 2:48 a.m. on February 14 and struck the fire truck head-on. He died at the scene. Police said speed is also a possible contributing factor in the crash. Four members of the Yonkers Fire Department who were in the fire truck involved in the crash were treated for non-life threatening injuries. "We remain deeply saddened by the loss of a member of our Yonkers Police Department family. Detective Frank Fernandez was a valued member of the Yonkers Police Department with over 15 years of dedicated service to the department and the Yonkers Community. This unfortunate and tragic accident leaves behind a wife and two small children, our thoughts and prayers go out to his family." Fernandez, who was 45 years old, had been with the Yonkers Police Department for 15 years.